Question 1: Write a Regular Expression that matches both dialog and dialogue. Answer: Since you should always keep your RegEx simple, my best answer would be dialog|dialogue . Slightly more elegant but more complicated would be dialog(ue)? I’ll just invite others here (and for every other answer) to submit alternative ideas. Answer: ^/secondfolder/?pid=(123|567)$ — note, I chose to put a dollar sign at the end so that the regex stopped matching if anything came after the three digits at the end of the target strings. Question 4: Write a funnel and goal that includes three steps for the funnel and the final goal step (four steps in all), using Regular Expressions. Notice that there are two ways to achieve Step 2. The RegEx for Step 2 is hard to read in the picture above, it is /store/(creditcard|moneyorder)$ . Notice that I added a dollar sign at the end of all the expressions above. Without context, it is hard to know which ones are mandatory, but we know for sure that the dollar sign in Step 1 is mandatory. That dollar sign is required, not because of regular expressions, but because of the strange way funnels sometimes work. 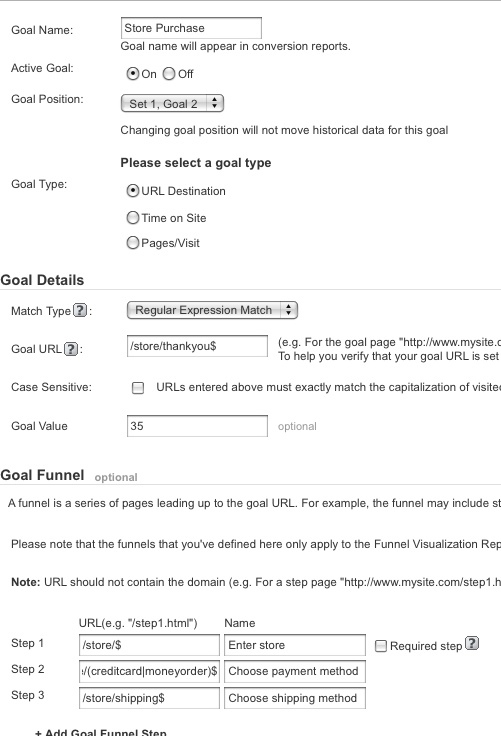 For more information on that one, you might want to read this excellent post on goals and funnels that Jonathan Weber of LunaMetrics wrote. Seriously, your ebook was so full of win. I’ve been trying to wrap my mind around RegEx and have been using the basics in GA for a while. But I really expanded my understanding b/c your explanations were so plain English and applicable to GA. A lot of tutorials I saw online weren’t written for GA and were written by propellerheads, I suspect. ?